Some have claimed that criticism of Israel creates a “hostile climate” for Jewish students, obligating universities to subdue student speech and activism on the issue. For example, The Israel Law Center recently issued a letter calling on universities to monitor and censor Muslim and Arab student groups. In response, Gespass’ letter maintains that such claims have no basis in law or fact. Supressing student speech critical of Israel would violate the Constitution. 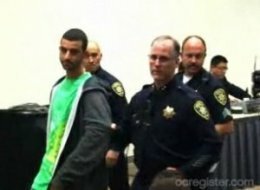 Student groups have reported interference with room booking, prohibition of fundraising events, threats of lawsuits, and repressive actions directed against protests, including the notable criminal case of the “Irvine 11,” in which eleven Muslim students at the University of California-Irvine were criminally prosecuted for engaging in a nonviolent protest of Israeli ambassador Michael Oren’s speech at their university. The National Lawyers Guild was founded in 1937 and is the oldest and largest public interest/human rights bar organization in the United States. Its headquarters are in New York and it has chapters in every state. The letter is available for download in full at http://www.nlginternational.org/report/NLG_Students_Rights_1011.pdf.